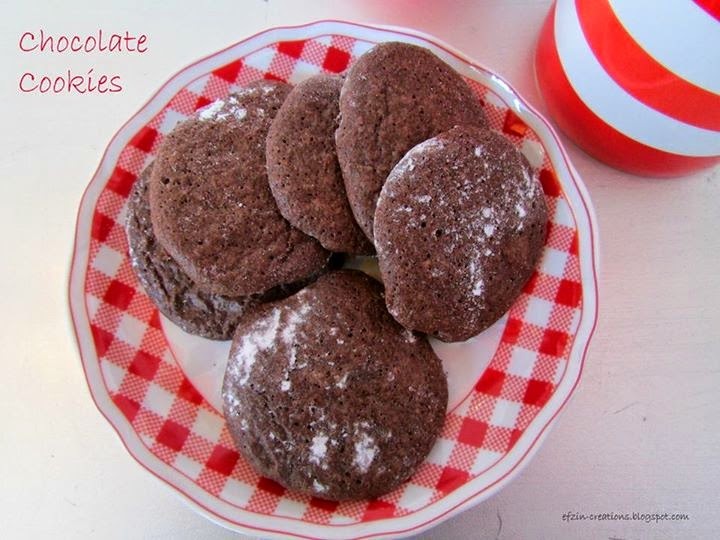 Soft Cookies full of Chocolate!!! It was about time to have another recipe in my blog. And especially due to Valentines day… I do not know why, but I listen about Valentines my mind things only chocolate!!!! So how about an easy to make recipe for soft cookies that are the same time crunchy enough full of chocolate for a special Valentines Day Breakfast in bed???? – In a bowl mix the sugar with butter and add one by one the eggs. – When the mixture is ready, just add the chocolate spread and the flour that has already been mixed with baking powder. – Cut the almonds in small pieces and put them last in the mixture. – The mixture is ready, full of chocolate! Use a spoon to add spoonfuls in a baking pan covered with cooking paper. – Bake them for about 15-18min to 160 degrees. – If you wish to add more aroma and not just chocolate, you may add a sugar spoon of orange shavings or vanilla. – For more sweet taste, just serve them with flour sugar!! – The amazing plate and the cups perfect for Valentines day, can be found in Kritikou Shopping Therapy. More beautiful cups in amazing colors! Hope you will enjoy them!!! !